The redesigned Safe Browser for Android has been a big hit! Thousands of parents have installed the browser and setup parental controls on the Galaxy Tab, Kindle Fire, etc. As can be expected, the first version had a couple of glitches that are fixed in the latest (2.0.1) update. Update the Safe Browser from the Google Play Store (or by sideloading on the Kindle Fire) today! Parents and school administrators typically install the browser on his/her own device before setting it up for the family or school. One of the key issues faced is with removing the app, which required some jumping through hoops. The new update greatly simplifies the install and uninstall process. 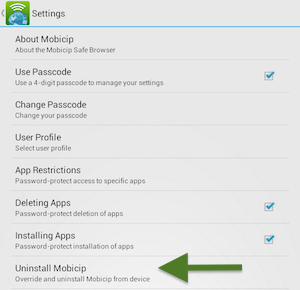 Simply open the Safe Browser menu, select Settings > Mobicip > Uninstall Mobicip. Enter your passcode to remove the app and associated parental controls in a jiffy.